I’m not in the business of predicting stock market crashes. Plenty of so-called financial experts have died on that hill and I have no intention of joining them. I don’t know what the stock market is going to do today, tomorrow, next year, or any other year. Your guess is as good as mine. There will eventually be a stock market crash. I don’t know when or how big it will be, but it will happen. Put those together and you get a lot of investors who’ve experienced nothing but growth for a long time, and who could be in for a big shock when the crash eventually comes. I don’t want that to be you. I want you to be fearless, but prepared, so that you can take the next stock market crash in stride and stay on track toward your long-term goals. To do that, you need a plan. Here’s how to make it. Every time there’s a stock market crash, people act like it’s the end of the world. Like they’ve never seen anything like it before. Like it was totally unexpected. But stock market crashes are not unexpected. They’re a normal part of the investment cycle. The stock market lost 36.55% in 2008 (source). It lost 9.03% in 2000, 11.85% in 2001, and 21.97% in 2002. It lost 25.90% in 1974. It lost 35.34% in 1937. It lost 8.30% in 1929 before losing 25.12% in 1930 and another 43.84% in 1931. The only thing that’s strange about a stock market crash is people acting like it’s strange. Don’t be that person. Understand that stock market crashes are normal and expect that, at some point, you are going to lose a lot of money in the stock market. Then, when it happens, you can react rationally instead of losing your mind like everyone else. Even when you know it’s coming, a stock market crash is hard to stomach. Day after day you watch all that money you’ve worked so hard to save disappear, without any idea when it will end or how far it will go. It’s tough. It really is. But here’s the thing: the stock market has always recovered. Sometimes it’s taken years, but it has always come back even stronger than it was before. 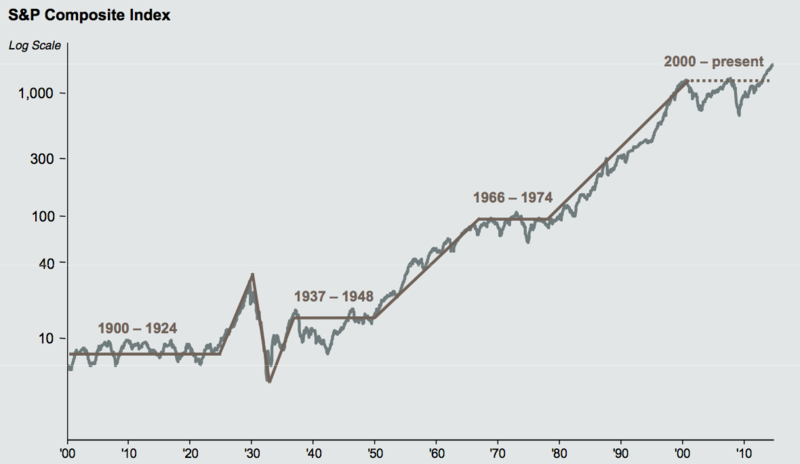 This chart shows the growth of the stock market from 1900-2014. It’s pretty easy to see the relentless trend upward. Every crash is followed by a recovery. Which means that if you stick with it, you’ll be rewarded. There’s no sense in trying to predict when these crashes and recoveries will occur. If you could do it, and if you could get in and out of the stock market at the exact right times, you’d get rich beyond your wildest dreams. But no one in history has been able to do it with any consistency, so the very idea is nothing more than a pipe dream. What you can do is a lot less exciting, but also a lot more effective. You can select an asset allocation that expects both crashes and recoveries and prepares you for both. At its core, your asset allocation is how you choose to divide your money between high-risk, high-return investments like stocks, and low-risk, low-return investments like bonds. The balance you choose affects both the potential returns you can earn, and the risk you take on. Your bonds provide a cushion during a stock market crash. This portion of your portfolio should, at worst, lose a lot less than the stocks in your portfolio. Your stocks provide growth during the subsequent recovery. This is what allows you to earn your money back and then some. Both are important to have in your portfolio, and your job is to choose a balance that both feels right and lines up with your personal investment goals. A reasonable rule of thumb is to expect that 50% of whatever you have invested in stocks could disappear during a market crash. You would, of course, expect it to recover and then some over the subsequent years, but you can use that guideline to help you figure out just how much you’re comfortable risking. When the stock market does crash, your asset allocation will naturally shift out of balance. You’ll have a lower portion of your portfolio in stocks than you intended, simply because your stocks have lost more value. For example, let’s say that you have $100,000 invested and you have a target asset allocation of 70% stocks and 30% bonds. That means you’d have $70,000 invested in stocks and $30,000 invested in bonds. Now let’s say that a market crash causes a 30% drop in the stock market, while the bond market remains flat. After that crash, you would still have $30,000 invested in bonds but you’d only have $49,000 in stocks. Which means that your asset allocation would have shifted to 62% stocks and 38% bonds. In order to get back to your target asset allocation, you’d have to sell $6,300 of your bonds and use it to buy more stocks. That’s right, you’d have to buy into the stock market at the exact moment that it’s in the middle of crashing. That can be nerve-wracking, but that is the essence of rebalancing. And it’s a necessary part of your investment plan because it keeps you from getting too far out of balance during both the bad times and the good times. And it’s especially effective during a market crash because you are essentially buying stocks on sale, which puts you in position to benefit even more from the subsequent recovery. So plan to rebalance at least once per year, whether the stock market is high or low. Your investments will thank you. Your plan is only as good as your ability to stick to it. Then, at the bottom, you can sign and date your commitment to this plan. And when the stock market starts to crash and you start feeling nervous, you can pull out this document, review your plan, review your commitment to it, and know exactly how to stay on track. Real investors know that a stock market crash is coming. They know that they can’t predict when it will happen or how big it will be, but they are ready for it nonetheless. If you follow the steps above, you’ll be ready for it too.